The Smart MSD helps prevent your components from micro-cracking during reflow through proper management of humidity control while components are in the individual chambers. Digital display shows temperature and relative humidity percentage within the InoAuto locator software. System manages components in accordance with the J-STD-033B standard. MSD levels managed are 2, 2a 3, 4, 5, 5a. 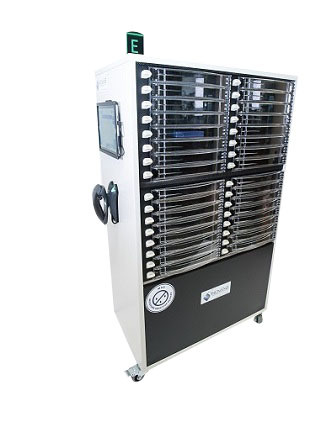 The Smart MSD Cart has 32 isolated hives that can store reels up to 13”, as well as trays, PCB stacks, and other packages. The modular design of the hives ensures ease or maintenance. Hive assemblies can be easily removed and replaced if necessary, without the need for expensive tools or expertise. The Smart MSD Cart uses a desiccant dryer system to remove moisture from the air. This dry air is then circulated throughout the system to maintain less than 5% relative humidity in each hive location. When a customer needs to place a package into the Smart MSD Cart, they scan the package information into the system, and place it into any hive that can accommodate the package. The Smart MSD Cart detects when the hive is opened and closed, and automatically records the stored location. When customers need to retrieve parts, they can browse the inventory or upload a picklist. Any smart locations containing required packages will illuminate allowing the customer to quickly and efficiently locate their parts. The Smart MSD Cart detects when customers open and close a hive location, and automatically records the package removal. Every time one of the isolated hives is opened, circulation is cut off throughout the system to ensure that no other location sees a rise in humidity. Once all the hives are closed again, circulation resumes, and an individual hive can return to under 5% RH in under 4 minutes instead of 30 to 90 minutes for a standard dry box. A relative humidity sensor monitors the system to ensure proper performance. The InoAuto Smart MSD Cart is compatible with Inovaxe’s InoAuto locator software, our MSD tracking software, as well as with Inovaxe’s kit and stock management software, InoView. The InoMSD tracking software can be fed with transaction data and humidity data to properly track the life of MSD components, based on their sensitivity level, to give customers powerful auditing and traceability features. 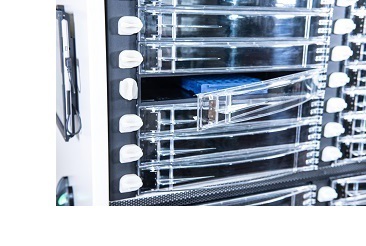 The Smart MSD Cart can be used in conjunction with our other Smart Storage Solutions. Additionally, Inovaxe’s flexible API can be used to communicate with customer software, such as MRP, ERP, and MES.